November | 2012 | What the blackbird said. Songs through a brick wall. My neighbour, Freddie, loves The Killers. Really loves them. He also likes to play them loudly whenever he’s in his room working. For the most part, I don’t really mind – I was quite a fan of Mr Flowers in his heyday, and I defy you to find someone of my generation who wouldn’t include Mr Brightside on the teenage years section of the soundtrack to their life. As with all things though, there is a line that, once crossed, cannot be uncrossed. It turns out my line for The Killers is listening to their entire first album five times, back to back, through an adjoining wall whilst trying to get an early night. My upstairs neighbour loves a thumping bass line at midnight, midday, and, indeed, most of the hours in between them. He’s fairly indiscriminate in his tastes, to the extent that at first I thought he had an actual double bass up there (I play double bass, it’s not common, I was excited). Turns out what he actually has is a really loud stereo that can make my ceiling shake if he’s on one. Completing this haven of tranquility is the fact that my flat backs onto a gym, which at set times each evening hosts exercise classes including bootcamp circuits, zumba, and (impossibly) line dancing. I am not a member of said gym, so I’m speculating about the nature of the classes, based on the variety of music and grunting that fills our corridor at various times. 25 songs that I can identify through a brick wall (or whilst hoovering or drying my hair). Literally anything by The Killers. Judge for yourself how many of those I enjoy by choice, without the wall between us. For the first eleven years of my life I saw Van Gogh’s Sunflowers every day. There was a poster on the wall of my kitchen that was actually larger than the real thing (we moved after that and I’m not sure what happened to it). It’s one of my mum’s favourite pieces, so I made a point of seeing it the first time I went to the National Gallery and I’ve seen it many times since – I even bought her a print last Christmas that has hung on her wall since then. Yet it was last week before I noticed the most obvious thing – it’s desperately sad. Laugh if you like – I almost laughed at myself. This is an image I have seen around 5,000 times in my life (genuinely – I just did the maths), but stood in front of it that rainy afternoon I saw it with new eyes. I whispered, out loud but to nobody in particular, “They’re all dying.” And they are. 14 dying sunflowers. How had I never noticed it before, you might ask? Fair question – it’s glaringly obvious to anyone with eyes and I’m meant to be doing a Masters in this stuff… The simple answer is, I’d never needed to. When I see Sunflowers I don’t look at it. I think about my childhood, I think about the house where the poster hung and growing my own sunflowers from seeds up the back wall. When they grew as tall as they could, I’d cut them and put them in a vase in front of the picture (meta for a seven year old, right?!). Most of all, it makes me think of mum in that yellow kitchen, the happiest I can remember her. But, as I stood looking at the real thing last week, seeing it for the first time, I realised I was only remembering half the story. Yes, that poster was in the background of all of my happy memories, but it was also in the background the first time I remember seeing both of my parents cry. I remember sitting in front of it when I covered my ears so I didn’t have to listen to my dog’s kennel being broken up after she died. I remember staring at it when things happened that I didn’t want to try to understand. I remember sitting opposite it alone with a glass of milk every time I begged my dad to stay and he didn’t. It lurks in the background of snapshots of loved ones who aren’t here to flick through the albums with me anymore. And now I understand (as Don Maclean would say) what Sunflowers is all about. 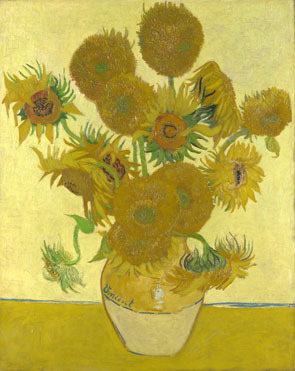 For Van Gough, Sunflowers were a symbol of happiness, just like for me. The famous painting is one of a cycle of four of the same subject, at various stages. It’s the most challenging, but also the most true – it’s still a happy painting, even though the subject is sad. Because as everyone who was ever in primary school knows, when a sunflower dies it leaves all of the seeds ready to be planted and to start growing again. Sunflowers is about that cycle, about taking the good and the bad and being ready to go again. Because what else can I do with all of those seeds it’s dropped in my mind?